The future is now. Sort of. We’ve all seen those thermo-reactive toys and nicknacks that kids find magical. For example: t-shirts that add color when the sun hits them, sun glasses that darken in the sun and the kids toys that turn hot pink when you dip them in water. Well, some big brain took that idea to a billboard. When the temperature is warm you can navigate your smart phone without any worries, but when it’s cold? That’s a different story. So Nokia developed a phone that works when your gloves are on. Novel idea! Once a company has these novel ideas and then produces them they then have to raise awareness of them so they can empty the shelves. Billboards are remarkably effective in this endeavor and even more so when the message is creative and unique. Enter the Nokia ad stage left. Picture this: The day is done. You wait for the trolly on Broadway surrounded by the darkness of the starry night. It’s a bit chilly so you slip on your jacket and gloves. After a hard day at work you now feel the radiant heat of your body trapped in thermo layers of cotton and synthetic fibers and it allows your mussels to relax. You lean back on the bench and smile. This night is off to a great start. You pull out your phone intending to call a loved one and spread the warm feeling you’ve got with conversation through connectivity but you can’t dial your smart phone with gloves on. Frustration snaps you out of your element and jabs at your medulla oblongata. Then you see it. Nokia’s ad just changed due to the temperature drop. They’re selling a solution to your problem! Now you’re going to go get that phone. Dialing or navigating the web with gloves on seems like such a good idea. It’s solidified. It’s sold. That’s the power of creativity through need and suggestion. It would never have been so powerful a message had you not been cold. Billboards are messages that speak to us while were out and about in the world. They inform and promote and can be oh so successful when the message is pithy and relevant. Arizona Billboard Company can help you get your message out there. Call us. Maybe you’ve got a novel idea that will help sell your goods or service. Let us help you design that advertisement so it is as effective as it can be! Modest dips or rises in total vehicle miles traveled across America will continue – up or down – depending on the season or other market conditions. In these difficult economic times, some national media are in decline because the audiences they reach are eroding. But, outdoor advertising remains a growth medium because it reaches mobile mass or targeted audiences day and night. By far, people spend more time in the out of home space compared to the in home space. When they are outside the home they are consuming, mobile, and part of the outdoor advertising audience. In today’s consumer environment, message overload has made it difficult for brands to cut through the clutter and get noticed. Fragmentation has changed the way consumers perceive media. Over the past 30 years, the number of television channels per household has increased dramatically while magazine and radio options have skyrocketed. Today, consumers choose the ad content they will accept. TiVo has changed the way people watch television, satellite radio and iPods have changed the way people listen to music, and mobile devices have changed the way people find printed news. Outdoor advertising is benefiting from technological advances in communications. Outdoor is an efficient media buy compared to other traditional media. In contrast, television and radio rates continue to climb as audience share erodes. Outdoor advertising is there 24/7 and reaches highly mobile American consumers with effective advertising messages. The current economic downturn and resulting change in consumer behavior will have a negligible effect on the reach and frequency of outdoor advertising messages. In fact, during an economy in recession, outdoor advertising, with its high cost effectiveness, may be the best option for companies looking to increase brand awareness and maintain their competitive advantage during tough economic times. 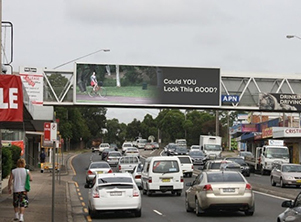 Digital Billboards Go Viral. . . Because They Can. Digital billboards are a great way to advertise and they are more inexpensive than traditional billboards because they are easy to put up and take down and they have differing time spans with each contract. So is it any wonder people are using digital billboards to fan the flames of sport rivalries? We think it’s as funny as the gen manager of North Carolina Fairway Advertising company thinks. See, both sides of the rivalry are paying him to post ads that intentionally display misleading information. Specifically, one ad says “Proud to call you one of our own, Russel!” then shows a badger and the hashtag #gobadgters. What’s the problem? Russel is spelled wrong. It’s Russell with two L’s. Who care’s? I don’t care about a former Badger / Pack/ Seahawks quarterback but I am fascinated with how viral the board went over the spelling error of dropping an L with an exclamation point. It shows us how much people pay attention to ads. When you put up an digital billboard or a traditional board you are reaching out into the community. And Arizona Billboard Company can help you make that ad as effective as it can be. We might not get you globally viral but we know how to target your audience. And digital billboards are a great and affordable way to do just that.